“Paris Street; Rainy Day” by Gustave Caillebotte. The Art Institute of Chicago. Author Mark Sayers is one of today’s best cultural observers. In his new book, “Facing Leviathan,” he deconstructs our consumer / spectator culture and talks about the need for leaders to break free of it. The “society of spectacle” is hardly new, but it’s been accelerated by entertainment, social media and our ever-increasing number of choices in every aspect of life. 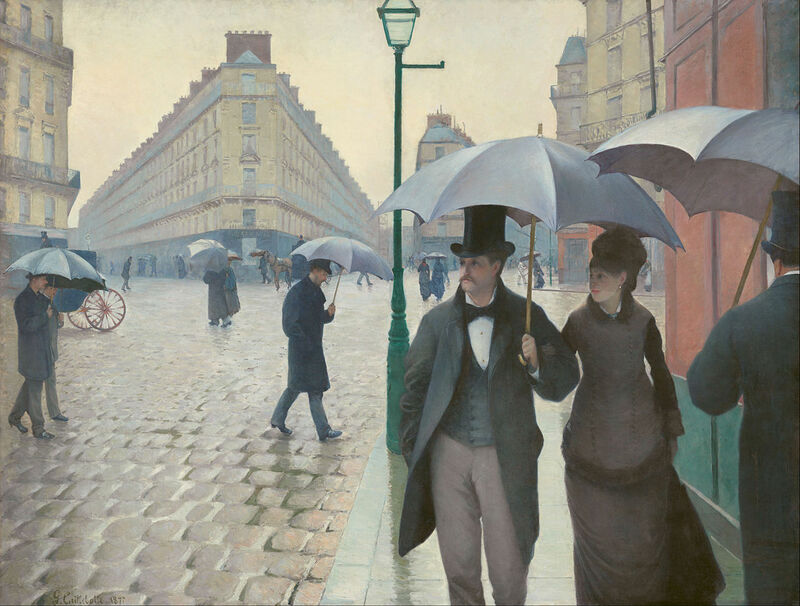 If Caillebotte were alive today and wanted to paint a present-day scene to convey the same idea, he’d have plenty of inspiration. Go to any crowded place and watch the level of interaction between people (little to none) and then between individuals and their devices (nearly constant, with heads down). Then, sneak a peek at what most people are doing on those devices: Facebook. Candy Crush Saga. Angry Birds. Cat videos. Any sort of entertainment to engage them so they aren’t forced to interact with (or even look at) the people around them. News organizations and individual journalists hear constantly that mobile devices must be our first priority in delivering information. While I understand that from a business standpoint, as a writer and reporter I’m also concerned. When everyone’s walking around under their own umbrella of sorts, tuned into their preferred entertainment frequency and social network, the rest of the street can become pretty foggy. That doesn’t portend well for our neighborhoods, our cities, our culture. The journalist’s job – recognize what’s important and make it interesting – becomes more important and more challenging than ever. Our work can serve as a connector for all of those individual umbrellas … as talking points for the culture. Likewise, anyone reporting stories of God’s work on the mission field is helping set the tone for what gets talked about, prayed about and supported financially. But first we have to find and report those stories, then deliver them to the umbrellas – not just to the church pews – using the same networks that deliver the candy and the cat videos. Most people aren’t clamoring for these stories, nor will they go looking for them – because they don’t know they exist. That’s our challenge, and that’s the danger of everybody walking around with heads down under umbrellas. This entry was posted in Culture, Technology, Uncategorized and tagged culture, journalism, reporting, technology. Bookmark the permalink.